Heatmine says its units have significantly reduced production costs at a greenhouse crops business. A Canadian startup called Heatmine is hoping to generate warm feelings toward cryptocurrency mining by using excess heat from computers for building heating in Quebec. The company is looking to put its crypto mining servers into buildings and use the waste heat from them to help power central heating systems — for free. Each of the company’s Heatmine units can crank out 75,000 Btu per hour, enough to heat 2,230 square feet of space for a day. Excess "heat can be used to warm private houses, warehouses or greenhouses,” said Heatmine in a press release. Heatmine units warmed up churches and greenhouses across Quebec, Canada in field tests this year, said the company. 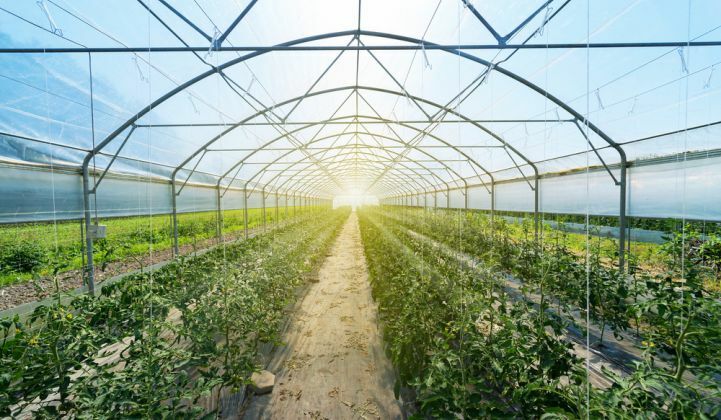 It cited the owners of a Neuville, Quebec-based fruit and vegetable growing business, Le Caveau à Légumes, as saying the technology had helped “significantly reduce our production costs” for greenhouse crops. Heatmine aims to distribute a million cryptocurrency miners, made from graphics processing units, or GPUs, in five years to “solve the long-existing heating issues in Canada,” said the release. Heatmine’s CEO, Jonathan Forte, told GTM that building owners would not be charged for hosting Heatmine units, as the company would make a profit on crypto mining operations. “The clients do not have to pay for the electricity that is used for generating the heat,” he said. Heatmine would also take care of installing and maintaining the hardware, he said. The company has started winter-testing 15 Heatmine units, spread across a greenhouse, a private home and several warehouses. Over the next 12 months it is aiming to build 750 Heatmine units, each with around 66 GPUs and processors. The company is also building an assembly line capable of producing 10 Heatmine units a day, to allow it to reach 15,000 within half a decade. The Heatmine units should be able to deliver 1 percent of the heat needed across the province of Quebec. “For now, we don’t plan to export or sell the product,” said Forte. Heatmine is, however, looking for a distribution partner, he confirmed. Keeping Heatmine within Quebec allows the company to dodge concerns about carbon emissions, since almost 100 percent of the province’s electricity comes from renewable sources, according to Canada’s National Energy Board. Energy use remains a big problem for cryptocurrency mining. Even though consumption has dropped off drastically following a fall in major crypto values, the Digiconomist Bitcoin Energy Consumption Index still places Bitcoin mining above Bangladesh or Romania in terms of annual energy use. The idea of using crypto mining’s waste heat to replace heating energy is not unique to Heatmine. Elsewhere in Canada, at least two similar initiatives have made headlines this year. In March, for example, the CTV Television Network carried the story of an enterprising Winnipeg, Manitoba crypto miner who was using his servers to heat his business. And in January, CBC News featured another Manitoba-based sustainable food production company called Myera Group that was looking into using heat from crypto mining to warm an aquaculture system also using water from fish farming. In France, meanwhile, a firm called Qarnot is commercializing a crypto mining device that doubles up as a home heater. Unlike Heatmine, Qarnot aims to sell its crypto heaters to end users so homeowners can make money from mining while substituting part of their heating bills. In January, Qarnot won a CES Eureka Park Climate Change Innovators Award, said to be aimed at recognizing exhibitors at the Consumer Technology Association’s annual show that are placing bold bets on their technology’s ability to cut greenhouse gas emissions. “By locating companies’ computers in buildings where heat is needed instead of data centers that have to get rid of excess heat, Qarnot reduces the carbon footprint of computations by 75 percent,” said a press release.